Cita Rodriguez from Pampanga, Mayeth Bacay from Batangas, Gladys Aurin from Laguna, Melody Lumbao from Legazpi, and Reno Donor from Quezon City shopped at the SM Store with their MasterCard and brought home an AUDI A3 during the recent The SM Store and MasterCard promotion. MasterCard VP Jo-Ann Camacho (left) and The SM Store VP for Marketing Quennielyn Cua welcomed the winners and led the symbolical awarding at the Audi Edsa-Ortigas Showroom. Mayeth Bacay from the Municipality of Bauan here in Batangas; Cita Rodriguez from Guagua in Pampanga; Melody Lumbao from Albay, Legaspi City; Gladys Aurin from Los Baños in Laguna; and Reno Donor from Quezon City were the five lucky winners of an AUDI A3 2.0 TDI during the recent The SM Store and MasterCard promotion. Top Gear gives this description of the German car each of these lucky winners now possess: "This third generation A3 debuts the new Volkswagen Group MQB platform, upon which around 10 million cars a year will be built. It’s clever, highly flexible and features some technical jewels that help make the A3 much more premiumfeel than before. They don’t come cheap but do help distinguish the A3 from mainstream alternatives." 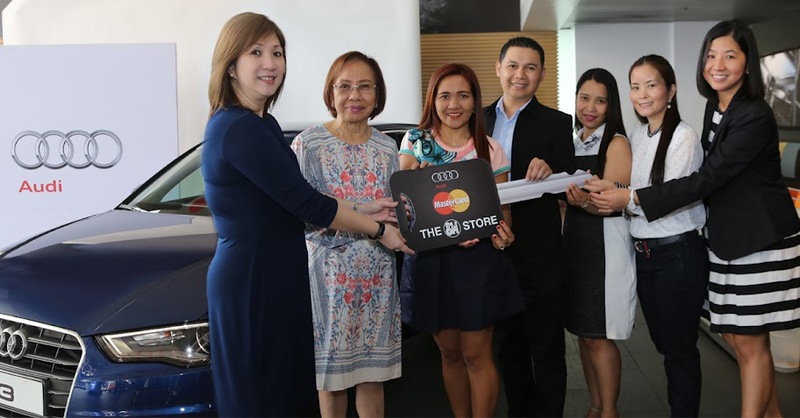 A joint project between The SM Store and MasterCard, every Php 5,000 single receipt purchase from The SM Store using a Philippine-issued MasterCard entitled cardholders to one electronic raffle entry that gave them a chance to win one of five AUDI A3 2.0 TDI cars. For Cita, Melody, Mayeth, Gladys and Reno, it was as easy as shopping at the SM Store, using their MasterCard, and winning a luxury car. Cita Rodriguez bought Christmas presents for family friends, and various charitable institutions she supports from the SM Store in Pampanga; while Melody Lumbao’s winning entry came from shopping for appliances at SM Makati. Gladys Aurin, who loves shopping at SM because of the SM Advantage Card rewards, bought a sofa bed, comforter, and shoes at the SM Store in Calamba; Mayeth Bacay bought shoes at the SM Store in Lipa, where she is a regular shopper; and Reno Donor bought Christmas gifts as well as a mobile phone at the SM Store in Marikina. The #BestChristmasGift promotion is one of the many exciting promotions of the SM Store.